Join me on an incredible journey where you will embark on a secret road, where you will discover the enormous power within you. The Third Road…where your dreams and reality become one. The Third Road will lead you on a secret journey where dreams become your reality. Discover a hidden world that God intended you to be in, where the words like peace, love, and hope will resonate for you. I will gently guide you as you travel on this metaphoric road where you will release the emotional baggage from yesterday, travel to a place of self-love today, and find in your future the reason you were created. Your adventure starts now. Join me on this incredible, secret, journey to your new home; an awesome home where you will discover the enormous power within that will bring you true happiness. 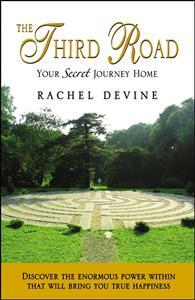 The Third Road is one of those books that can be read over and over. Every page is captivating. The first chapter pulls you into the book and you feel like you are traveling on an exciting adventure on the third road. Rachel's writing style is extremely vivid especially when she described childhood memories, I could feel some of my very own childhood memories. This is a must read book for everyone who believes in God, but more importantly for one who is not sure of God's existence in this chaotic world in which we live. The sprinkling of scripture verses reinforces the message of salvation and unconditional love God/Jesus has for us His children. It gives one a feeling of hope. The Third Road would be a wonderful book for discussion. since discussion groups could benefit from the text. The poems written at the end of each chapter could very easily be a meditation. At the end of your journey you arrive at an amazing place of serenity called home. Its compact size allows one to tuck it into a purse or pocket. It is a gift that keeps on giving. It is the perfect gift for someone with whom you want to share Gods existence, caring and unconditional love. The Third Road is a positively delightful book that helps you reconnect with your true self and more importantly with your Creator. It shows you practical ways to overcome obstacles that may be keeping you from enjoying life to its fullest and becoming the person you were meant to be. It has poignant stories, words of wisdom and soulful poetry that all help you discover the journey towards inner peace. Rachel Divine has a beautiful gift in her way of showing you that everyone has unimaginable potential and incredible self value and the best part is all you have to do is look within. Thank you so much Rachel Devine for writing this masterpiece.